At one point, infant sleep positioners used to be something you’d find on every baby registry list. We all know that babies should sleep on their backs, and what better way to make sure they do than by using something that will keep them in this position? However, in 2010, the Food and Drug Administration (FDA) and Consumer Product Safety Commission (CPSC) issued a warning to all parents to stop using these positioners as they post a safety risk. 13 babies died as a result of using these positioners; the either rolled over and had their faces pressed against the positioner, or got trapped between it and the side of the crib. 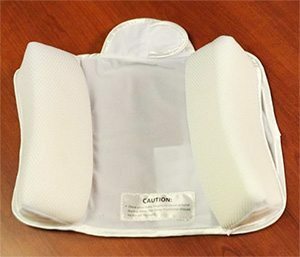 These sleep positioners were an awful idea, and if you have one, you should not use it. Please get rid of it! Sleep positioners were meant to reduce the risk of SIDS, but the fact is that they never really did this, and only increased the risk of things going wrong while your baby sleeps. After these warnings were issued, most manufacturers ceased production of these items. You probably won’t find them in stores, but you should be warned that some can still be found for purchase online, or at second-hand stores. You might look them up online and find that there were no recalls for it, but that doesn’t make it safe. Please don’t use it! It’s simply not safe to have anything extra in the crib or bassinet besides a mattress and crib sheets. Some parents try to create their own positioners with pillows or rolled up blankets, but this is simply not safe at all. Anything extra in the bed, even blankets, can be a suffocation hazard. A completely different type of positioner not included in the CPSC warnings, crib wedges are perfectly safe to use. The reason is that these are placed underneath the mattress to elevate it slightly. The main reason for these are to reduce reflux or certain breathing issues. Please talk to your pediatrician before using these wedges!